Sew Mama Sew giveaway day is one of my favorite days of the year. Good thing it comes around twice a year! I love finding new blogs and if I'm lucky to win a little something... well that's the icing on the cake! Head on over to enter lots of other giveaways too. My regular readers (if I still have any!) have probably noticed that I have been missing for quite sometime! I've been pretty busy with life (new baby) but I've also been super busy working on a new site/project. I am now ready to start accepting customers for machine quilting services. *eeep* I'm so excited! The site still needs a few tweaks here and there but I can start accepting customers now. I'm running a super special right now so make sure you check it out if you need help turning those tops into quilts. You could get a quilt top machine quilted for as low as $30! Spots fill up fast as I limit the number of quilts I take in per month. OK enough of the info-mercial. We all know you are here for some fabulous hard to find, out of print "fish in bags!" I will give 2 fat quarters, one blue one white, to one lucky reader. I will ship to anywhere in the world even! The giveaway will close December 16 and a winner will be chosen on December 17th by random number generator. I love my followers so you get an extra entry if you follow my blog. The best way to keep up with any specials I might be running is to follow my new Machine Quilting blog and you'll get an extra entry too. So that's it 3 easy ways to get your name in the pool for some super cute fishy fabric. Can you offer cotton quilting as an option!! I was all about to sign up for quilting, but I guess I'm just a stickler about wanting cotton quilting to match fibers. Oh, I think it would have to be custom quilting and not just patterns or FMQ sqiggles! I've been considering custom quilting for awhile but I'm always scared off by how stringent the 'rules' seem. I think I'd be most enticed by a laid-back friendly vibe. Free binding is a good idea. That way it would come back completely finished. P.S. Love the blue fish fabric! So cute! I have to say free binding....I detest that part!! And I have oh so wanted some of that fabric!! Definitely free shipping! I live in an area where there are several local custom quilters, but it's really not worth the drive / time for me to get to them. I'd much rather drop something at the post office and have it show up at my doorstep again! oh yes, free shipping is always lovely! I think showing quilting patterns and techniques would be enticing. I always end up stippling my quilts because I can't imagine what my other options are. AND just started following your Quilting Blog! Can't Wait! oh! I love that print! hope I 'm lucky! I have never used the service of a machine quilter. I think space would be a reason why I would use them. If I wanted to make a big quilt, I would be struggling a bit. I think price is the big determination. Some times I want custom quilting and some times I want a simple meander. So variety is important too. But it seems the more popular people get the more expensive they get. Well I can't afford to pay for their popularity. An awesome price - seems like you have that covered, and free shipping always gets me! I have been reluctant to get into quilting because I know eventually I will need to quilt it. But quilting services are so expensive it takes away from the thrill of doing the quilting in the first place. So I would probably only send it out for quilting if it is large and special and the price is reasonable and I am reassured I am getting a quality result. I've never made a quilt, though I want to. The very newbie-ness of the craft would make me want to send whatever I pieced together out for quilting. As a newbie I would be starting from the points of price, and recommendations/reviews/ratings (which are huge for me when looking for products or services online). price is a big determiner - also the size of the quilt, if its small, I'm more likely to attempt to do it on my own..
Price is my biggest deterrent. Free shipping might be the thing to tip the scales for me to decide to send it out. Price is a big factor, and I have to see some samples of their work. These are adorable patterns. I just plain can't afford it. Plus I'm really afraid of it being lost in transit. Price is the biggest factor. Great giveaway! For me, it's all about great photography/samples. Thanks for the chance and good luck with your new business! price is a big factor, but really, the biggest enticement for me would be having a quilt bigger than I could handle by myself. Price + shipping is the biggest factor for me. However, I think I would need to want a really specific design that I know I can't do + a good price to send a quilt out. I think it will always come down to quality and price. Good luck with your endeavors. I think either a good price on the quilting or free shipping would probably be the best ways to entice me to send a quilt to be quilted! I have also started following your quilting blog. I think price and a large variety of quilting designs to choose from would entice me. Also, quality would be a big factor. I agree with pricing - different prices for different quilting. I've sent one out - I love the results!! Price, and possibly free return shipping. I don't think I'd mind paying for it to get there, but shipping back to me free would be nice. I'd want to be able to have input on the quilting, too, which is probably why I still quilt my own quilts (though very poorly). I'm a follower. Thanks for being part of Giveaway day! Those FQs are so fun. great fabrics. i've been sewing for ages, but i'm fairly new to quilting. i think i'd be most likely to go with someone that was personally recommended. along with a decent price, free shipping usually makes up my mind! I think is the biggest factor for me... But if you did the binding too I would be even more inclined! Size. Anything larger than crib/baby/lap size, and I'll probably send it out. Honestly I enjoy quilting my own quilts so I am not sure anything would - but.... if I am paying for any service I would expect quality workmanship good communication and some individualized service in a timely manner. I've never sent out a quilt to be quilted, but I'd be tempted to do it for free shipping, and a reasonable price of course. Thanks for the darling giveaway. I have never sent out a quilt..
it is something to consider though. what a cute little guy! congrats on that baby! i would love to use those FQs for a quilt for one of my little guys! I sent a quilt to a local quilt shop to be quilted and bound for the first time last year, mostly because I was pregnant and knew I wouldn't have time to do it myself. The quilter did a GREAT job and I would totally do it again! I think it would just depend on the quilt. If I really wanted a fancy design I'd totally pay to have it quilted. I've just never made anything like that yet. Thanks for the chance! I think free shipping would be a big help! I've never actually sent a quilt to be quilted. I'd probably say price would be an enticing factor though. What would make me send out a top to be quilted is the creative vision of the machine quilter. If it was just going to be stippled or meandered, I would do it myself, but I would like to see a couple of quilts taken to the next level by having custom quilting done on them. It would be worth the price! I follow your blog in my RSS reader! I guess it would have to be someone in the same country, to cut down on shipping costs. I'm a follower. Thanks for the chance to win the fishy fabric. Hands down, free shipping and a great price comes in at a close second. The actual quilting is my least favorite part. I have never sent a quilt out. I have always figured it would be WAY too pricey. I think that some really good reliable reviews would entice me to send it out. I love the idea of not having to do all of that hard work myself, in my limited space, but I'd be worried about damage/loss/etc. Free binding would be wonderful! I hate doing that part. free binding service. for sure! I do all my quilting myself, by hand, so it would take a lot to sell me on paying to have something quilted. It would have to be reasonably priced and really well executed. Thanks for the chance to win awesome fabric. Great giveaway. Lots of Heather Ross fans visiting, I'll bet. Free binding would get me! no minimum charges would be my thing...sometimes i just don't have the time to quilt a baby quilt, or small throw, and i hate having to pay a minimum fee for that. Free shipping as always enticed me to send out my quilt to be quilted! Good question...I think free shipping will entice me to send out my quilt to be quilted. I have not actually thought about having someone else quilt for me. I think the motivation would come from reviews/testimonials from other people talking about the quality. 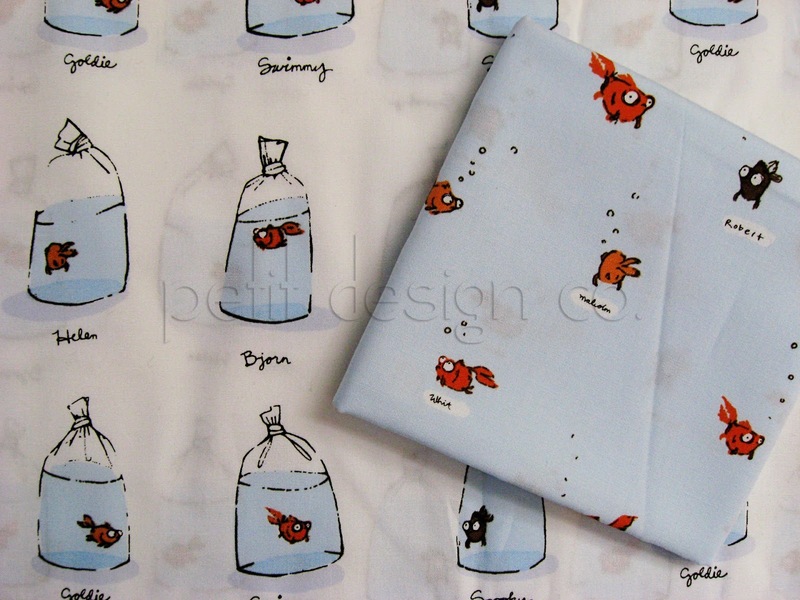 I LOVE the fish in a bag fabric! Adorable! Free binding would be awfully nice. Love the fabric! I think price would be a big factor for me. If there was a really good deal on something I couldn't do myself (i can do straight machine quiliting, but if there was something extra fancy that could be done for a great price) then i'd be tempted. For now, i like doing the whole process myself. Cute fabrics! Thanks for the giveaway. I'm just starting to get into quilting, but I think for me cost would be the big hang-up in terms of sending my quilt out to be quilted, so I would be enticed by reasonable regular prices and occasional special deals like free shipping and so on. I have never sent a quilt out to be quilted by someone else but if I did free return shipping would be pretty awesome. That or free batting. Both of those can be big expenses so that would equale out to a great savings! Also, if you had a portfolio I could look through quickly instead of having to scroll through an entire blog would be awesome too. oOOoO I love this material! I would be tempted for free edging... thats for sure. I like layering it and I like getting it all pinned but I HATE doing the edge. YUCK. $30 is a good price for your special! Well, I haven't had a quilt sent out before, but if I were, I'd send it out to a lady in our town who always does a free personalization on each quilt. She does the design requested, and then in one square, in designated spot, she quilts in the recipient's name "To Tommy, from Grandma" or something of that sort. She calls it her little blessing to her customers. Lovely giveaway! I've never sent a quilt out to be quilted...but I would consider doing it on a quilt I'd spent a lot of time on if there were good reviews for the quilter and if there was free shipping. Free Shipping for sure would be nice but also if I lived somewhere where there wasnt a long arm quilter. I've sent a few out for donation quilts, but never a personal one. Honestly, the price is terrifying! If I could find something affordable, I'd consider it far more often. I would also need a quilter who can do snowflakes, because.. well, honestly, I wouldn't send something out to be stippled. I can do that. But a cool design like snowflakes? Offer snowflakes and a lower cost, and I'm all over it! and those fat quarters are to. die. for. I think the price would be the deciding factor for me. So far I've only made baby quilts so I've done it myself on my machine but I'm working my way up to larger quilts so I know I might have to consider sending them out at some point. Especially because my quilting is really lame! honestly, i've never thought about sending out a quilt to be quilted, but price would definitely be a huge factor! I've never done one before, so maybe a tutorial on what to do when you're ready for that? Like, "Just finished your first quilt top? Beginners click here for information on what's next"
Would love to win this fabric to make a cute quilt for my baby boy on the way! Free shipping would be a great incentive to get those tops quilted! I'm a new follower, too! Oh how cool, I love those fishies! Not having to crawl around on the floor to make the quilt sandwich is enticement enough for me! I've never sent a quilt to someone else to quilt, but I have to say that it would be price combined with the ability to have a quilted design that I can't do myself. That being said, it also scares me to think of sending my quilt off and having it possibly messed up or lost in the mail or something, so I'd have to feel like I can trust the person who is doing the quilting! It helps to have pictures of other customers' quilts...they get exposure for their work, and so do you...win-win! Free shipping would be awesome so would the price. It's a pity you're in another country, otherwise, I would sign up for the special. Thanks for the chance. Price is a big thing for me... I'd be enticed to send my quilt out if it's something I couldn't do myself. I would send it out if the price was good. OR... if it were something really special that I knew would look fabulous done professionally. Low prices would be fabulous, but free shipping would be icing on the cake! I think price is the most important for me, Great communication between myself and the longarmer is important too. Thanks for the fantastic chance at these yummy fabrics! Free shipping and great price!Thanks for the chance to win and merry Xmas! Oh dear...it would definitely be about the price for me...which would include the shipping both ways...that would add up. Those are some of the most adorable fabrics I've seen! Free shipping would probably be good motivation for me to send out my quilts for quilting. I would also like a large picture portfolio to get an idea what the final product would look like. Someone to take care of the whole process (batting, quilting, ideally binding as well) would be cool. I've never sent a quilt out but I am considering it. Free shipping would definitely help! I am scared to send somewhere that I have to ship my quilts. I guess it would be price that would get me to try it though. I haven't considered sending out my quilts because of a fear of them possibly getting list along the way and because of the price. I'm a follower. Cute fabric. I think free binding would be cool! Love the fish fabric too! Free binding would be my choice. Great fabric, and thanks for the giveaway! The only 'bad' experience I had was I had asked for a design to be off center and the quilter centered it. Next time I'll leave instructions in writing. I'm now a follower! I'm also following your new Machine Quilting blog. Best of luck! Definitely Free Shipping would be great! Awesome quilting designs might entice me...love those fish! I'd have to say a combination of awesome price and knowing that the quilter does good work. It's scary to send a labor of love off if you're unsure of the hands it's going into. A great price would be nice! I don't quilt so I don't know what would get me to do so. I would send a quilt out to be quilted if it was a master work of pieced awesome that I was afraid to dork up AND the price was right. Some beautiful design that I couldn't possibly do! I guess it would be an awesome recommendation - that might make me send out a quilt. I would love to win your giveaway, thank you for the wonderful prize. free shipping is always so tempting to me! good luck! In would be enticed by ebing able to skip the basting stage! Thanks for the awesome giveaway, I'm going to check out your site to learn more about sending a quilt out for quilting! Free shipping is always a plus, especially if you're talking about a king-size quilt. Lack of time and a deadline would get me to send it out. Thanks! Wow, $30?! I haven't really investigated the world of long-arm machine quilting because I always thought it was priced out of my league (I figured $150+? ), so you definitely have my interest! I guess some consultation into the type of quilt design would be a big plus too! Like some other commenters, I always thought sending out for quilting would be out of my budget...that's a fantastic intro price you're offering! Price but also creativity in the quilting which I'm willing to pay more for. I've never outsourced my quilting, but I have considered it. I'm very intimidated by the rules of what the quilter expects. If I were to use the service, the quilter would have to be pretty laid back. I am swooning over that fabric...I love it!!! I would have to say an awesome total price. I would say free batting! i think free batting. thanks for the chance. I don't know. A really good price I guess. I'm not a big quilter at this point though. I have a favourite machine quilter who I trust with my quilts- and she lives only a few miles away! I would say awesome price. Well that's interesting. I so happen to have a beautiful quilt top ready for quilting right now. I guess I just want someone to give me unique ideas for the quilted pattern. The quilt itself is designed by me for my daughter and it's a twin size. Once I get a back finished, I guess that best enticement would be original and unique design ideas. And I would have to trust that it would make its way back to me. Scary to send it away in the mail!!! free shipping and free binding would be amazing. Love your work. Not very much would entice me, I like quilting my quilts! Maybe free batting, maybe! I LOVE the fishy fabric, I have a 2 year old who is a fish fanatic. So wish I could get some of that!! I'd be worried my work wouldn't be "good enough" for the person, and they might laugh at it. So some reassurance for beginners would be nice! Sending out a quilt: Of course, price is always an issue, but I think most importantly being able to see the exact design to be quilted on my fabric. Maybe an overlay so I could make sure I liked the look since there's no going back after sending it. I have you saved in my favorites folder, but only recently started a blogger account. Now I can follow you and get an extra entry... yea!! for me definitely FREE SHIPPING. i'm from malaysia. i can't afford to pay the high cost of shipping. i just follow your blog. thanks again. Hello! I hand-quilt my own quilts, but the thing that is going to entice me to send out a quilt for the first time is the quality of custom-quilting. I also follow your new blog! What a lovely giveaway! I live in Ireland so there are not so many options to send your quilts out to! I suppose a great price would make all the difference. Good luck on your new business! That the price includes everything. I hate surprises at the end of long paying process. A large quilt that I couldn't do on my domestic machine would be the only thing I would consider sending out, so I suppose price would be a huge factor. I'd probably have to pick someone local (or at least Australian) and preferably someone I knew, at least by online reputation. Hmm... I'd love to see samples as well as clear information about costs/services provided. Well, I think free shipping would certainly be a winner for me. In fact free anything really would certainly help entice. I've only ever got 1 lot of quilts machine quilted. Just last week actually. And the deciding factor was that they were in Australia and another blogger/flickr user that I'd been in swaps with. Free shipping would be an interesting option. I've never had a quilt professionally quilted as there aren't many quilters offering it in the UK and those that do seem very expensive!! I am not a quilter but I do love to sew and I just adore those little fishies! Could I still enter to win? Please? I think having good prices, lots of options, and lots of pictures of your work would entice me. I want to be able to select my batting, and I like doing the binding myself. Free shipping to my mind means I'm just paying for it in the price (and subsidizing other people's shipping prices), so that's not as appealing. I would want to know that I'm going to receive a quilt that is quilted better than I can do it and that it won't take forever. I've thought about using a local long-arm quilter (and still may), but it is hard to fathom parting with a quilt for 2 months. I'd rather have my name in the queue and then be able to drop it off the week that she's going to be working on it! I'd also only send off really big quilts, which is why I'd prefer reasonable prices to marketing gimmicks. Those are just my thoughts/ideas - I'm sure everyone has their own preferences! Good luck with it! A great price and in East Anglia. I almost always send my quilts out instead of me doing it. A fair price and good quality work are important. I spent forever on a quilt I loved and had it custom quilted and was very disappointed when I got it home. Something as basic as quilting a quarter of an inch from my stitch line, it was done wobbly like they'd been drinking and they never said anything to me or redid it.